Paul Bains (2006). 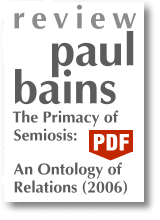 The Primacy of Semiosis: An Ontology of Relations. (Toronto Studies in Semiotics and Communication). Toronto, Buffalo, London: University of Toronto Press. 186 pp. ; ISBN 10: 0-8020-9003-6, ISBN 13:978-0-8020-9003-4. The conditions on the surface of a planet without living organisms are determined entirely by the sun's energy and the laws of physics and chemistry, as James Lovelock showed convincingly (Margulis, 1999). The interaction between organisms and matter is one in which organisms interpret and structure their abiotic environment according to biological principles. Parallel to this, the relationship to other organisms is a communicative one: their mutual behavior underlies changeable semiotic rules of sign use with which the biological individuals interact, i.e. coordinate and organize. The difference is that organisms cannot develop such a to follow or not follow-relationship with natural laws, but underlie them in the strict sense.